Do I look outdated in this tool suite? This webinar promises a few laughs, but also a few sobering moments when you likely recognize your organization’s mistakes. Don’t become one of Andy’s war stories, sign up today. In today’s fast-paced, disruption-prone markets, it’s not enough to simply optimize for feature delivery. Your entire organization must be aligned around the right outcomes and empowered to achieve them, because velocity and throughput count for nothing if you’re not delivering real customer value. Leadership needs clarity to ensure that the organization’s strategy is delivering on key objectives and producing high-value outcomes. It is this shared understanding of work that helps to create an outcome-oriented culture, where everyone is accountable for delivering value instead of just velocity. How well are businesses operating in 2018? Are we delivering on time, on budget? Are we optimizing resources, reducing obstacles? In a recent survey, ProjectManagement.com found that the State of the Modern PMO isn't that modern. Join us to hear the survey's key findings, real-life customer observations from Altice USA and Pitney Bowes, and recommendations on how to evolve your project portfolio management. Presented by Andy Jordan of Roffensian Consulting, Kurt Steinle of Broadcom, Lawrence Rizzo of Altice USA, Gale Persil of Pitney Bowes. Creating an organization focused on employee happiness is a major step to retaining your employee base, motivating them, and increasing engagement (saving money!). To do this, many organizations are implementing agile across the business and creating a purpose-driven, outcome-oriented culture. In this webinar, Longda Yin, Principal Agile Consultant at CA Technologies, will give clear examples of how you can use agile to influence happiness, specifically because agile delivers work with a purpose. Resource management - ensuring projects are given the right people, with the right skills and the right availability to do the job. This is often easier said than done when you lack a single view of what people are doing today and what’s planned for tomorrow. But it doesn’t have to be this way. •Team members assigned to multiple projects, making it hard to see who's working on what and when. •Developers track time in one system, contractors in another. •Resources with varying experiences and expertise are scattered around the globe. Andy combines exceptional industry insight with practical experience delivering strategy, which will help you understand how to build perfect portfolio management in your organization. Here's your opportunity to Ask the Agile Expert, Laureen Knudsen. Join us for our webinar, "Connect Strategic Planning to Agile Team Execution", on Tuesday, October 9, 10am PT / 1pm ET, and then bring your questions here. If you are a business leader, lacking the data you need to be informed, or a project team, constantly getting interrupted for status updates, you won’t want to miss this discussion. As digital transformation continues to disrupt businesses, and in particular IT, CIOs are finding themselves having to adapt every element of their portfolios. Whether it’s the internal products and services that support the core business customer facing solutions that drive organizational value, or the transformation initiatives that support the ability to adapt and adjust effectively and efficiently, nothing is as it used to be. Join former Gartner analyst and renowned portfolio management guru Donna Fitzgerald as she discusses the implications of digital transformation on Its work for all of these project types. Here's your opportunity to ask an agile expert! Every organization undergoes different pain points during their agile transformation. We've been a part of many of those transformations, and our experts can offer insights and best practices for your organization to overcome those pain points. Join Laureen Knudsen, Advisor, Executive Management at CA Technologies, agile expert and co-author of Modern Business Management: Creating a Built-to-Change Organization and resident agile expert, on Tuesday, August 28th, for your opportunity to ask the questions on your mind as your organization starts, expands and scales agile across multiple teams and departments. The most successful companies are closing the chasm between strategy and delivery. To do this, you have to make enterprise-wide visibility the norm, consolidating relevant project data, and linking investments to customer value. You have to serve up real intelligence that enables leaders and working teams to sense and respond to competitive threats and market opportunities. Join Laureen Knudsen, Sr. Director of Advisors, and Joseph Valeriano, Principal Consultant, Agile Central, as they discuss how organizations are successfully connecting leadership’s investments and strategy to the work done at the team level. In this webinar you’ll see how each of these different elements needs to combine to form an effective environment for portfolio success and Andy will provide practical tools to help you build the roadmap for integration in your organization. The pace of business is accelerating and the difference between market leaders and everyone chasing them is often their ability to make decisions faster than their competition. Integrating a modern BI tool, like Microsoft Power BI, with a market leading PPM suite creates a game-changing engine that provides insight into the ongoing activities to accomplish your strategy. Insights that can steer and level-up your company in today’s ultra-dynamic market place. Join Treb Gatte from Tumble Road and CA’s Marc Leijten to discuss the power of data insight, and to discover how the combination of two market leading tools can take your organization to the next level of project execution. Are your employees happy? Have you asked them recently? You should. People who are happy at work are more productive. When rolling out agile in an organization, one of the key metrics our agile consultants and coaches encourage companies to measure is employee happiness. What makes people happy? Being a part of a purpose-driven organization with an outcome-oriented culture, knowing the work they do is aligned to the overall goals and strategies of the company. Join us to learn more! Finance managers are rarely included in project planning, and if they are involved in the project tracking it is usually in a passive way. At the same time, all stakeholders expect to have the latest project financial situation available on demand and customized for their personal use. And if that weren’t enough, there’s often no integration between project and financial management systems. But it doesn’t have to be this way. Join agile project management expert Rick Morris of R2 Consulting for an overview of how financial managers can take charge of project finances and use their expertise to add new value to the organization. Here's your opportunity to ask an agile expert. Every organization undergoes different pain points during their agile transformation. We've been a part of many of those transformations, and our experts can offer insights and best practices for your organization to overcome those pain points. Join Laureen Knudsen, Advisor, Executive Management at CA Technologies, agile expert and co-author of Modern Business Management: Creating a Built-to-Change Organization and resident agile expert, on Tuesday, August 28th, for your opportunity to ask the questions on your mind as your organization starts, expands and scales agile across multiple teams and departments. Delivering projects on time, under or on budget with the limited resources can be challenging. Often, there are multiple tools to juggle – project management, time management and resource allocation and finally financials. What about those global projects spanning business units? Now layer in the executives’ requests updates, which instantly become fire drills. So much to do and only one of you. Join agile project management expert, Rick Morris, R2 Consulting and CA Technologies for an overview managers can overcome these common obstacles and be more successful in the enterprise. Mit CA Agile Central kann Ihr gesamtes Unternehmen wie ein leistungsstarkes Team arbeiten. Verknüpfen Sie Strategie und Umsetzung. CA Agile Central zeigt Ihnen, wie Strategie einerseits und Umsetzung und Bereitstellung andererseits zusammenhängen, damit Sie schnellere, klügere Entscheidungen treffen können. Mit dieser agilen Lösung können Sie Ihre Strategie und die tägliche Arbeit koordinieren, die Bereitstellung in einer vorhersagbaren Kadenz verfolgen und verwalten und wichtige Daten nutzen, um die Performance schnell und präzise zu messen. Neben der Identifikation der „agile Value Streams“ wird in diesem agilen Modell auch ein agiles Projektportfoliomanagement etabliert und ausgerollt. Wie der Wandel vom Projektgeschäft hin zu einem kontinuierlichen agilen Wertstrom erfolgt. Wie erfahren in diesem Webinar, wie mehrere agile Teams in der Praxis effektiv und effizient zusammenarbeiten, welche Fallstricke zu beachten sind und was die Vorteile eines agilen Wertstroms gegenüber typischen Projekten sind. Darüber hinaus bietet sich die Gelegenheit, Anwendungsfälle und offene Fragen aus Ihrem Unternehmen mit unseren Experten zu diskutieren. Wir von 3Pworx und CA Technolgies freuen uns auf Sie und auf eine rege Teilnahme. Bitte melden Sie sich gleich an! Come see how Clarity PPM helps companies accelerate innovation and fuel growth. 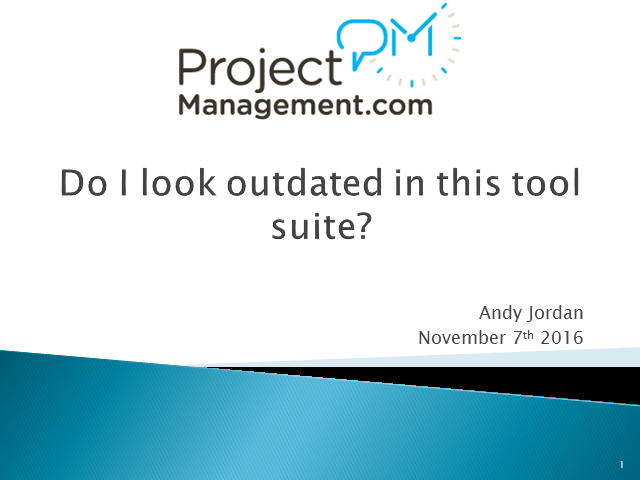 Title: Do I look outdated in this tool suite?